Thank you all for coming. It is with a heavy heart that I am standing before you all today. While there may be sadness, there is also a sense of hope and anticipation of the unknown. There comes a time in everyone’s career when they realize that it is time to move on, to pursue other interests, to set new goals and work toward achieving them. I have come to that point. I look forward to waking up on a Sunday and not having to leave my family and go to work. I look forward to exploring new places, trying to new hobbies and, frankly, just relaxing on the couch. When I think back on my career, I realize how unique it was. People hadn’t seen something like me before. That’s not me being arrogant, that’s just the era that it was. I’d like to think that I brought people joy and satisfaction. That just for a little while, they could forget about their problems be it work, or money, or certainly their health. I did things differently than those before me, I did things my way, and in the end, I think people appreciated that. I want to thank the fans for their support these past two years. I couldn’t have succeeded without them and their hunger for greatness. Lambeau Field is a special place, and I will always cherish my two years here. I couldn’t have hoped to work with a more professional group of people, people so happy and willing to serve the fans of the Green Bay Packers. I’d like to thank Mark Murphy for giving me the opportunity to be a part of the team. I also would be remiss if I didn’t thank the stadium crew who made each and every game day possible. The professionalism and dedication you displayed is second to none. To the hundreds of concessions staff and volunteers, you are the real pros. You put me in position to succeed and excel, and I can never thank you enough. You will always be in my casing. In closing, I would say that this is not the end of the ol’ Horse Collar, but rather a new beginning. 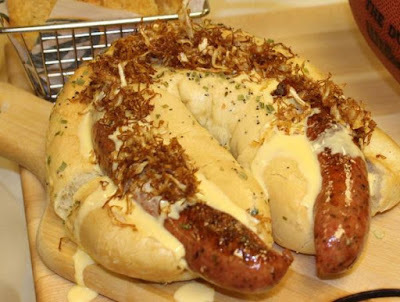 Packer fans should create me at home, experiment with new toppings, try different cheeses and breads, go crazy….but don’t ever forget the sauerkraut. The 'kraut is what always made me tick. Please keep me in your stomachs and small intestines always because you will have a place in my bun forever. Thank you. Good eating, and GO, PACK, GO.